My photos above will give you some idea of Glasgow’s latest award-winning boutique accommodation but, trust me, they don’t do it justice at all. They don’t show the vastness of the bedrooms, the detail in the tiling at the front door or the exceptional art adorning the walls. You will have to imagine the tranquillity of the setting, the exquisite scent which wafts through the hall as you enter the front door and the warm, relaxed welcome given by the owner as she hands over the keys. 15 Glasgow is unlike any holiday accommodation I have ever visited. This Victorian town-house in the smart Park Area of the city has been sympathetically restored by owners Shane and Laura Mackenzie to create a chic, contemporary B&B, taking care to ensure period details like cornices, shutters and sash windows remain as features. The hotel may be equipped with monsoon showers, flat screen TVs and WiFi yet it oozes prosperity, decadence and a sense of history. We were staying in two of the five rooms, the Mitchell and the Burrell. The silver and grey tones of the Mitchell were perfectly chosen, the room capacious enough to allow for a lavishly ornate black mirror and super king size bed. The Burrell, with its natural linen palette, de-stressed us as soon as we stepped on its cream carpet and fell back onto the feather and duck down pillows. The other rooms available include the Tower which is a one-bedroomed suite, even bigger than ours, ideal if you are a family with younger children who can share a sofa-bed. All rooms had tea and coffee making facilities plus, rather than the usual packet of ginger biscuits, foil-wrapped Tunnock’s teacakes which, strangely enough, disappeared within a few moments of arriving. We were tempted to nip round the corner to buy a bottle of wine, help ourselves to our hosts’ extensive DVD library then turn in for the night but it was Friday so we had booked a taxi to take us out to dinner. We probably could have walked, but we’d had a tiring day and, with there being four of us, it was the equivalent of not much more than a pound each. Coming home afterwards (funny how I have instinctively written ‘home’ there) we let ourselves in and spent a few minutes in the guest sitting room, all of us sighing as we settled into the deep cushions of the fireside sofas. It took some effort to extricate ourselves and wend our way up the stunning staircase to bed. As the 15 has no guest dining room, breakfast is delivered to each room. I loved that. You could choose anything from fruit and pastries up to the full Scottish. The breakfast was brought up in two courses giving us a few minutes to get a start on the muesli before the big fry up arrived. It was so relaxing to sit at the table in the window of our room and eat in peace. With access to limited free parking at the back of the hotel and extensive free parking at weekends in the street at the front, this is the ideal place if you’re arriving in Glasgow by car as we did. It’s close to the Kelvingrove Art Gallery and Hunterian museum and also easy to walk along Sauchiehall Street into the main city centre. 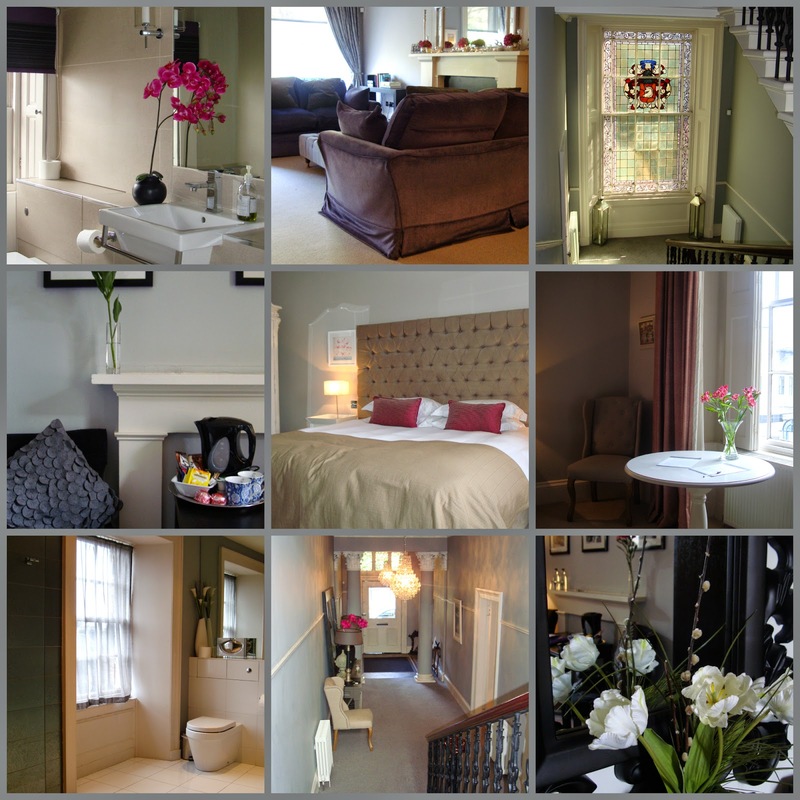 15 Glasgow has the benefits of a B&B in the setting of a luxury apartment. The owners have created a simple model for providing exceptional accommodation. But don’t just take my word for it: if you’re ever in Glasgow, try it for yourself and you’ll never forget it. We stayed at 15 Glasgow for two nights, courtesy of VisitScotland. Prices for 15 Glasgow range from £99 to £185 a night for both the Mitchell and Burrell rooms, including breakfast, parking and WiFi. VisitScotland’s internationally recognised Quality Assurance scheme is a benchmark for quality and service standards across the tourism industry and operates across accommodation, visitor attractions and food sectors. Do you stay in hotel when you visit or with family? Well worth trying if you need somewhere peaceful to stay. That looks so lovely…..and I like the idea of breakfast in your room. Such a simple idea and, with it being such a small establishment, it avoids all that awkward faux-cheeriness you might have to indulge in with other guests. If you're not a morning person it's perfect – you can eat brekkie sitting in your pyjamas watching the telly! We didn't use the public transport but that's good to know. meant to say 'me, not you' in that last sentence! Looks gorgeous, and I love having breakfast in the room- makes me feel posh, plus you don't have to get properly dressed and made-up to face the hoardes in the dining room! Have heard great things about Glasgow as a destination, I am at the wrong end of the country, but keep considering looking into flights for a short break to Scotland. I don't know why we don't opt for room service breakfast more often in hotels as it always feels so decadent. I suspect is because they charge extra, which is daft really, as it is probably worth the extra cost for the joy of eating together in your room. Glasgow would be a perfect weekend break – loads to do. Oh that looks and sounds just heavenly! I've never visited Glasgow but if I ever get the chance I shall definitely try and stay here! If we go again, we definitely will! Another Glasgow fan! Get booked – you will love it, Katy. Oooh brings back such lovely memories, of visiting my best mate in Glasgow and of huge halls in the place I stayed in every time we went to the Edinburgh festival. I've missed Scotland, have you done more posts on your trip or are there more to come (will have a nosy)?! Have done one on Glasgow already which you might have found. Have Edinburgh still to do so it might evoke even more happy memories for you, Penny. it looks like a really nice plea for a romantic getaway! lovely! You are so right, Otilla – very romantic. Oh now you've got me thinking of breakfast buffets and making a pig of myself. If I had to choose, as long as the room can accommodate a proper table, I think brekkie in the bedroom wins. I actually prefer having breakfast in my room so this would suit me down to the ground. It looks like a very special place to stay and a great central location for exploring the city further. We initially thought it might be a little too far away but it was perfect – very close to the University area and really not a long walk to the main shopping centre. And, of course, so blissfully quiet. Dougie's aunt used to work in the Edinburgh factory when she was a young girl, so a firm favourite with us. Sounds fantastic and my husband has never been to Scotland so will certainly keep it in mind. Always so much to do and see in Scotland – definitely worth it to show your husband what he's been missing. I've only ever done Edinburgh tbh too. Particularly drawn to the idea of Tunnock's Teacakes! It had masses of character – the details were just beautiful. We took Rory a few times when he was little – Loch Lomond, Edinburgh and even last year he loved Perthshire. Happy memories. THIS IS A COMMENT FROM MUMMY BARROW. I PRESSED DELETE INSTEAD OF PUBLISH! OOPS! oooooo nice, i'm up for a Scottish jaunt. really want to go on the over night sleeper train just for the fun of it! I've only ever done a sleeper once and that was when I was a child – we took the sleeper to Cornwall from Newcastle: it was brilliant. Shall we all go up to Scotland then!? Looks lovely, we have friends in Glasgow – this place could be ideal! Definitely worth keeping in mind, Jane. It sounds really lovely Trish, especially the full Scottish Breakfast in your room. Did you manage to get to the Ubiquitous Chip? The price isn't too bad, and well worth it if it is a luxurious as your pictures show. We did get to the Ubiquitous Chip – loved it! I plan to blog about it soon: may do a 'what we ate in Scotland' type of post as didn't quite know where to shove the Chip! Oh now this looks lovely, and just the sort of place we'd look to find when travelling. Bookmarked! I have long wanted to visit Glasgow and now I know where I'll be staying when I do! That's gorgeous. Did you get black pudding and fried haggis? So jealous. Black pudding for breakfast but haggis was only served for brekkie in our Edinburgh hotel. Had haggis, neeps and tatties at dinner though…. Oooh, that looks fabulous! Hubby's from Glasgow so we go there often, and I'll have to try this out! Wow, what a fabulous hotel Trish! Also great montage! You've been busy, just having a good old catch-up of your articles and BritMums stuff – you're on fire chook! I've missed so many of your posts! Time to catch up I think, this place looks gorgeous and a real treat to stay in by the sounds of it. I like breakfast in my room, not everyone does but I like to slob around as much as possible!